CARLETON PLACE, June 1: Cycling and active transportation advocates are urging County and municipal politicians to take advantage of new provincial funding available to encourage people to get out of their cars and onto bikes. Local delegates to last week's Eastern Ontario Active Transportation Summit in Carleton Place were enthused with the details they heard about the new $50 million Ontario Municipal Commuter Cycling Program, which has an application� deadline of August 18. Funding for the program comes from the province's Climate Change Action Plan, and it is being invested in commuter cycling networks and installation of more cycling facilities. Although much of the funding is directed at urban needs, there is also a stream of funding for smaller municipalities (population less than 15,000), under which there is annual funding of up to $25,000 available per municipality on a first come, first served basis, with the Province paying 80 percent of project costs. Municipalities may also pursue funding partnerships with third parties, including other municipalities (upper, lower or single-tier), indigenous communities, conservation authorities and municipal service agencies. Under both streams, funding is to be used for capital investments in new commuter cycling infrastructure and enhancements to existing cycling infrastructure to better support commuting cyclists. It cannot be used to support low frequency or temporary cycling infrastructure. "Infrastructure such as hardened shoulders and signage that would help get kids to school or employees to workplaces might be considered," said Ish Theilheimer, co-chair of the Ottawa Valley Cycling and Active Transportation Alliance (OVCATA). "So might bike racks, route signs, and other facilities that encourage everyday cycling." One of the highlights of the Summit for local delegates was the workshop on the Voyageur Cycle Route, a trans-Canada cycle route being planned with leadership from the Discovery Routes, a non-profit alliance from the North Bay area. They have successfully completed a route for cyclists travelling across Canada that extends from Sudbury to Mattawa, and now they are working on identifying and bringing together the needed resources and municipal partners to complete a route to Ottawa. 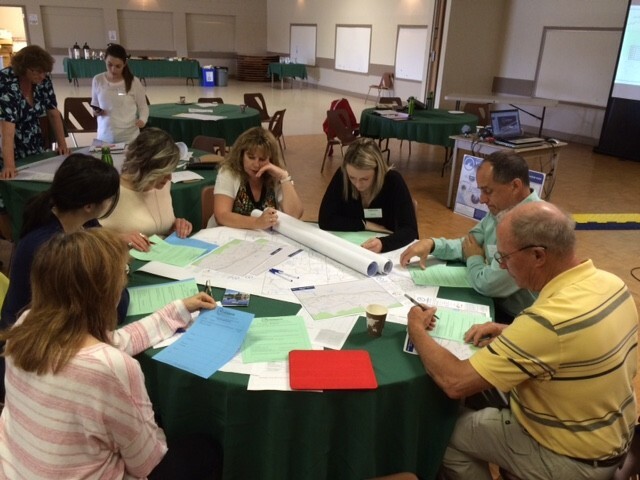 Delegates from Renfrew County participated in a workshop session going through maps, looking at route options, and listing the attractions, facilities and services along each route. PHOTO: Delegates to the Eastern Ontario Active Transportation Summit in Carleton Place look at maps and make recommendations for the path of the Voyageur Cycle Route through Renfrew County.� From top left around the circle: Melissa Marquardt (Ottawa Valley Travel Association), Stephanie Hessel (Ontario's Highlands Tourism Organization), Laura Brisson (County of Renfrew Emergency Services), Dave Unrau (Town of Petawawa), Ron Moss (Ottawa Valley Cycling and Active Transportation Alliance ), Kathy Eisner (Ottawa Valley Cycling and Active Transportation Alliance), Donna Maitland (Mattawa-Bonfield Economic Development Corporation).